Garden fairies here. We are garden fairies and we would like to give you all the inside scoop on The Christmas Cottontail, Carol's new book. First, we garden fairies need to tell you that the link we added is what they call an affiliate link so Carol gets a little something extra if you use it to buy her book from that online place that starts with an A. Second, we garden fairies noticed that Carol bought some new shirts with that Christmas Cottontail on them. One of the shirts is a really dark, dark, dark green which makes it appear almost black but Carol always and forevermore always wears green so we know it is green. She also bought a white sweatshirt with the Christmas Cottontail on it because even though she always and forevermore always wears green, she apparently has some rules that allow her to make an exception. Must be because it has holly leaves on it around the cottontail and they are green. But that is just a guess. We are garden fairies and we have not yet sorted out the rules Carol uses to decide if something is green enough for her to wear. That would take a lot of time, and we are garden fairies. Third, we garden fairies would like everyone to know that the Christmas Cottontail is a bunny which can be an enemy of the garden because some bunnies indiscriminately bite off tulip stems, eat green bean sprouts, and devour any spinach that germinates. But CC, as we are going to call the Christmas Cottontail because it takes a lot of garden fairy time to keep typing out Christmas Cottontail because look at all the letters in Chrismas Cottontail. 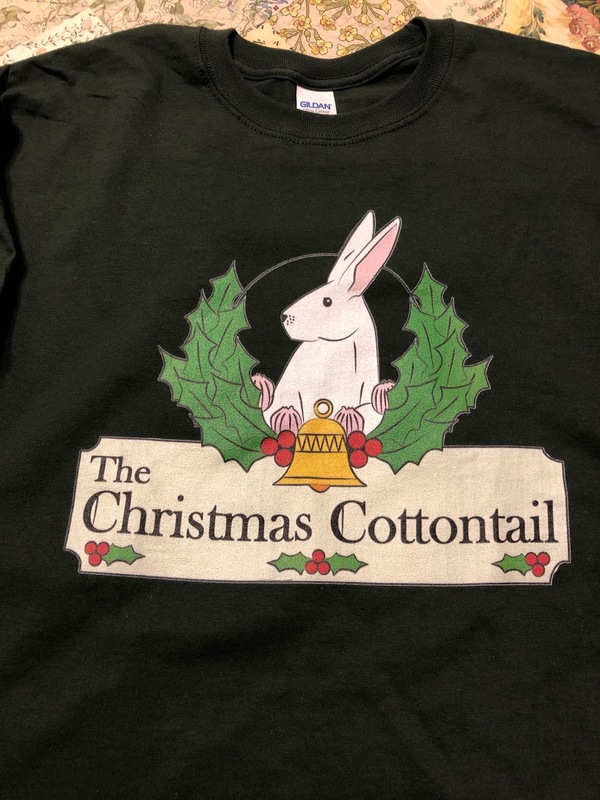 Therefore, we will type CC instead of Christmas Cottontail and everyone should know we are referring to the Christmas Cottontail when we type CC. 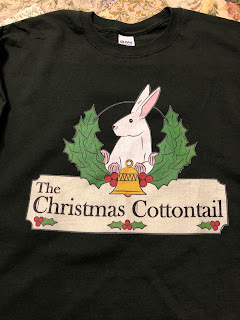 Granny Gus McGarden said we could have just typed out Christmas Cottontail for the rest of this post instead of CC and we might have typed Christmas Cottontail fewer times than we typed Christmas Cottontail explaining why we are typing CC instead. Whew. What were we talking about? Oh, right. CC, as we are calling the Christmas Cottontail, is actually a friend of the garden and a friend of all gardeners, especially good gardeners. We are garden fairies and we are not telling why. People will have to read the book to find out why. Violet Greenpea Maydreams, Chief Scribe for the Garden Fairies at May Dreams Gardens and publicist for The Christmas Cottontail. Buy it now! I've been a very good gardener and I am hoping CC will reward me! Okay, you have convinced me that I have to have CC under the CT this CE. Let's see if you garden fairies are smart enough to figure this out. You are quite the scamps teasing me like this! It is extremely nice of the garden fairies to be so complimentary of CC while they are so patiently awaiting their OWN BOOK.